Since June 21, after spending three weeks at the SOWER project at Camp Shoshanah in Keeseville, New York (about 90 minutes from Montreal), we have been staying at Ed’s sister Mimi’s house in Greenfield Park, Quebec, a south shore suburb of Montreal. Mimi is taking care of her and Ed’s mother, and this stay in Montreal allowed her to take a long needed vacation to give her a break and see her daughters, as well as allowing us to spend some time with Mom. We stayed until today, leaving about 10 a.m. for a long way around to Texas. The plan is stay on small roads (no Autoroutes or Interstates) to go through the Eastern Townships of Quebec to Maine, and then east to the Atlantic shore, then follow the shore south to somewhere in Massachusetts before taking the Interstate to turn toward Newark, Maryland to see friends on the Sept 14-16 weekend. We’d then turn south and west towards Texas. Traveling east on Hwy 112, our first stop was in the resort town of Magog, on beautiful Lac Magog. We found a restaurant (Étoile du Lac, L’Ancorage) that had seats on an outside terrace overlooking the lake. Behind us were tall, new condos with balconies and, in front, part of the Route Verte (Green Route), a 1500-kilometer, 2-lane, paved bike path already constructed through much of eastern Canada. Following 112 past Sherbrooke, we turned off on 214 to follow other roads towards the town of Lac Megantic, then north on a Quebec road through several towns on the Chaudière river, before turning east again to Armstrong and south to the Maine border. Once here, we decided that we would take Maine Hwy 6 all the way across the state to where it joins Hwy 1 in Topsfield, then down coastal Hwy 1. Today, we went as far as Jackman, where we found a city park overlooking Big Wood Lake. This was as pretty as any RV park, so we decided to spend the night, right there in the parking lot. As we walked toward the lake, we heard a loon crying its mournful song. A long drive today as well, traveling east on Hwy 6. We went through several interesting towns (including Greenville, which was getting ready for a sea plane fly-in weekend. The Moose River and Moose Lake were nearly constantly on our left. Patty actually saw a moose cow as we drove past! (Why else would they call the river and the lake after moose?). Moose everywhere. Here we saw a statue of a "Flying Moose", actually an Abenaquis native american story about a moose that saved a brave because he once saved the moose from a pack of wolves. 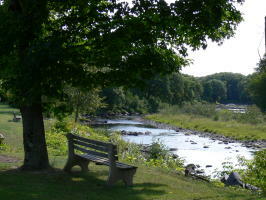 At mid-day, somewhere near Howland, we stopped for nap along a small river that flowed into the Penobscot. At Topsfield, we turned south on Hwy 1, and traveled until we arrived at Calais, but not before turning south just short of Calais to visit the Moosehorn National Wildlife Refuge. We were just 10 minutes late from seeing the Visitor Center! but still were able to take a walk through the refuge. On his way out, one of the park employees told us that there were frequent black bear and moose sightings. Actually, we wanted to see the “blueberry meadow” where a sign said “Limit: one peck per person”, but blueberry season is just now over. By the way, black bear is hunted here in Maine, and somewhere down the road, we say a Hummer with a shot bear on top of it. At Calais (pronounced “callous” in Maine), we found that we were again just 10 minutes late for the Maine Visitor Center. It was to open at 8 a.m. the next morning, so we again found a parking lot downtown overlooking the St. Croix River and the bridge to St Steven, New Brunswick. We stayed there overnight after taking a long walk through town. After picking up maps and brochures at the Visitor Center, we were again off south on Hwy 1. Our first stop was the St. Croix Island site where the French (Samuel de Champlain among them) made their first settlement in the New World in 1604. They decided on a small island, so that it could be easily defended if necessary. The real problem, however, was scurvy which took half of the men that winter, so they moved elsewhere the following spring. Interesting cottage along the way. We took 190 south from Hwy 1 towards Eastport, and passed through Pleasant Point, home to the Passamaquoddy Indians. If you saw the movie "Pete's Dragon", you would remember Passamaquoddy. As we approached Eastport, we stopped at a rest area and found out that the bay in front of us was close to/connected with the Bay of Fundy which has those tremendous swings in tide level: over here, about 18-25 feet! We were to see more of this in coming days. In Eastport, we took long walks through this place that calls itself the “Easternmost City in the U.S.” The ferry to Deer Island stopped running on Labor Day. We found that Eastport was having several festivals this coming weekend, among them a salmon festival, the Pirates festival, and a motorcycle rally. Tonight, there was to be a ball at the Chowder House in which prizes were to be given for the best “Pirate” and “Wench” costumes. 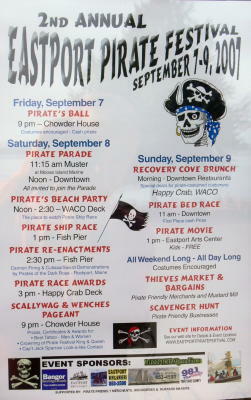 Tomorrow, clambakes and Sunday for salmon; all the while the town was decorated with pirate things. We found a great restaurant called the Waco (but pronounced Wacko) for a haddock fish dinner on a terrace overlooking the bay (very low on water). While at the restaurant, we saw several porpoises swimming in the bay. Back to Hwy 1, and a little south, we decided to spend the night at the Cobscook State Park for hot showers and a sewer dump (can’t always stay in parking lots). Here, we got a great campsite on the bay where we could place our easy chairs and watch the tide coming in. It was dry when we came in, and the water was rising. Later, on a walk through the day-use picnic area, we saw a bald eagle fly by! Exciting day. Saw this bumper sticker along the way. Actually, we saw a lot of them. Looks like the province does not like the idea of these supertankers in their waters. Decided to drive to Campobello Island in New Brunswick (across a bridge from Lubec, Maine). 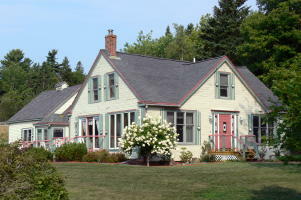 The island was the place where Franklin Roosevelt and his family kept a summer “cottage”. Some cottage! The grounds are now an international (Canada and USA) park with several interesting roads and walking trails. We were especially impressed by the long beach covered with rounded stones of many colors to a depth of several feet. No sand, no shells, just palm-sized stones! We drove to the northern tip of the island (length about 10 miles) to see the East Quoddy lighthouse. You can only visit the lighthouse when the tide is down because you have to walk on the sea floor to get to it. The lighthouse was abandoned by the Coast Guard a few years ago, and left to decay, but a number of local residents have taken it over and are doing a facelift. Patty climbed the stairs to the top of the lighthouse for a better view. You can see her waving from the top. Lots of sea gulls everywhere. We saw salmon ponds (Atlantic salmon farming) and a big fish weir (netting fish using the tides) near the lighthouse, as well as a gray seal (large, over 6 feet long) feeding near the weir. We found out later that the seals often are seen near the weirs for obvious reasons. In the distance, we could also see a whale spouting near some whale watching boats. Quite impressive. We drove to the south side of the island. What a difference in temperature and wind. It was cold! The coast here is very rough with hugh boulders, some covered in seaweed, instead of stone or sand beaches. Pictures is sugar loaf rock at the southern tip of the island. We also first saw eider ducks here. As it was late in the afternoon, the fog was settling in and we could hear the fog warnings from several lighthouses. The island also had a Provincial park with campground on it, so we decided to spend the night there. A short walk from the campground, and we were on this beautiful beach...deserted.